On a visit to New York to meet his publisher, David bumps into a man on the street – the sort of innocent collision that happens all the time on busy city pavements – who follows him back to Penn Station and confronts him. He utters two words, part question, part command, before disappearing again: “Remember me”. When John Henderson’s girlfriend introduces him to Catherine Warren, it is because she believes he can help her. Catherine is being stalked, and when John investigates he discovers that it’s not quite as straightforward as an ex-lover or shunned suitor. As David and John become entangled in this strange new world, a man named Reinhart is rallying troops for a push that could ultimately lead to death and destruction on an epic scale. There is something comforting, despite the subject matter, about cracking open a new Michael Marshall novel. Perhaps it’s the sense that you’re in a safe pair of hands, or maybe it’s just the knowledge that you have no way of anticipating what’s in store next from one of the most original storytellers of recent years. 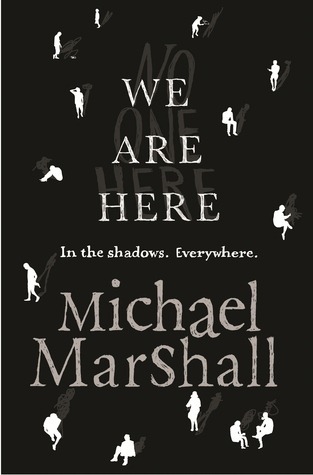 Like his previous novels, We Are Here straddles the boundary between straight crime/thriller and straight horror as Marshall introduces us to a world that exists just on the periphery of our own, a group of people who live in the shadows and who are largely forgotten, or ignored, by the people around them. In much the same way that Die Hard 2 is a sequel to Die Hard (the same central character finding himself in yet another, unrelated, but equally dangerous situation), We Are Here is a sequel to Marshall’s 2009 novel, Bad Things. John Henderson, who we last saw in the wilds of Washington state has moved to New York with Kristina and is now living and working in the East Village. Beyond that, there are no other major connections between the two novels, though long-time readers will have a better understanding of John’s background than people using We Are Here as a jumping-on point (if you haven’t read Marshall before, though, you should by no means allow this to deter you from starting here). In a move that now seems to be traditional for the author, Henderson’s sections are told in the first person, while the rest of the characters get chapters of their own, narrated in a third-person voice. The voice itself is engaging and down-to-earth, and much of the story is told in a conversational tone that is sometimes at odds with what’s actually going on. Contrary to what you might expect, this works very well, and serves to tie the different elements of the story (often off-the-wall) neatly together into a coherent whole. They made their way toward the platform via which they’d arrived at the station that morning. This turned out not to be where the train was departing from, however, and all at once they were in a hurry and lost and oh-my-god-we’re-screwed. David figured out where they were supposed to be and pointed at Dawn to lead the way. She forged the way with the brio of someone having a fine old time in the city, emboldened by a bucketful of wine, clattering down the steps to the platform and starting to trot when she saw their train in preparation for departure. The nature of these shadowy people referenced by the novel’s title is never fully explained. A number of theories are presented to the reader, in the form of theories held by various characters (are they imaginary friends long since forgotten by the people who dreamed them up? Are they ghosts? Are they something else entirely? ), and the reader is left to decide for themselves which they prefer, or which makes the most sense. Regardless of which theory is correct, Marshall has created a complex societal structure and set of rules which govern the actions of the group, giving these people some substance and background that is woven neatly into the fabric of the story. The return of John Henderson gives us a sense of familiarity and I, for one, enjoy the various interconnections between his books that define the strange world that Marshall began creating with his Straw Men novels. We Are Here also introduces a huge cast of new characters, which is a departure from the small, controlled groups of central characters that we’re used to seeing in the author’s works. With Marshall’s deft touch, though, each stands out as an individual and it is easy to keep track as the story progresses. In Reinhart, Marshall has created one of the most sinister and evil characters you’re likely to encounter in a piece of fiction. Despite the fact that he spends much of the story lurking in the background, his brief appearances are memorable and shiver-inducing. Another winner from a master of his game, We Are Here is a welcome addition to Michael Marshall’s growing catalogue. Part crime, part horror, part urban fantasy, it should appeal to new and old readers alike with its mixture of dark comedy, horror, mystery and abrupt violence. Fast-paced, tightly-plotted and beautifully-written, We Are Here packs thrills and chills into an intelligent story that, despite its fantastical elements, never loses its plausibility or sense of realism. If you’re already a fan of Michael Marshall then you’ll know what to expect. If you haven’t read the man’s books before, then We Are Here is an excellent place to start. Either way, you’re in for a treat.